On Windows (regardless of the version, whether it's W7, W8 or even W10), every time you connect a different device like USB sticks, Windows installs a new driver every time. So in some people, the number of pilots can be quite substantial. It is possible to erase these unused drivers in the registry, but it is not user friendly at all, on the other hand, there are tools that can facilitate this by giving a precise list of the devices connected to your computer, As well as the last use! 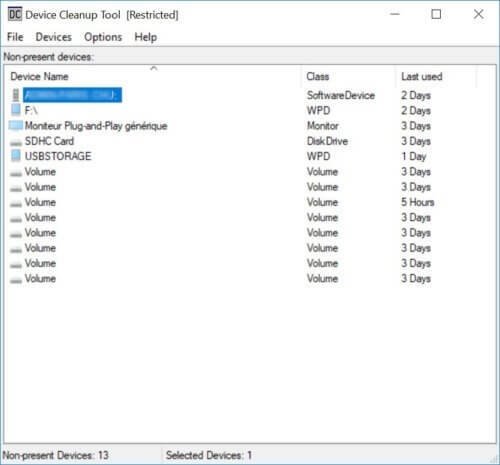 One of these tools is device cleanup tool (attention, the page lists all the software in the company, so take the device cleanup tool, or use this direct link) free and easy to use, but is not in French. Choose your version depending on whether you are in 32 bits or 64 bits. There you go! Note that I do not guarantee you a speed gain for your computer or a gain of disk space, but it is always good to do the cleaning from time to time, this helps to avoid problems especially that old drivers can often generate Problems on Windows.